The accessible music of David Matthews has been coming to the fore recently with a traversal of several of his symphonies and short orchestral pieces on BBC Radio 3. Add to this the recording of all his string quartets (twelve at the last count) by the Kreutzer Quartet on Toccata Classics. I have enjoyed the orchestral music so I was keen to hear an example of Matthews’ string quartet writing. The composer himself provides a brief booklet note that describes the considerable influence Beethoven had on him, setting out the reasons for the slightly odd set of works on the CD and providing a broad description of the eleventh quartet. Matthews says that both his eleventh and twelfth quartets are much indebted to those of late Beethoven - in particular the B flat quartet, Op. 130 and the C sharp minor quartet, Op. 131. In his contribution to the booklet the Kreutzer quartet’s leader, Peter Sheppard Skaerved also says that the eleventh quartet’s origins lay in a comment — possibly suggested by Robert Simpson’s Haydn-inspired ninth quartet — by the composer Matthew Taylor that Matthews should write a set of variations for quartet. 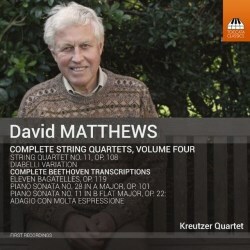 Rather than Beethoven’s late quartets providing the theme Matthews took it from his Op. 119, No. 8 Bagatelle which, the composer notes, was “written in four parts like a short score for string quartet”. The eleventh quartet finds its way from this “deceptively simple minuet”, gradually moving via the composer’s own language to a “rumpus-pastorale” fugue ending. After the theme the influences of Beethoven are, to my ears, suggested rather than overt — although the densest part of the Grosse Fugue is certainly not far away towards the end — and there are some similarities with the gritty world of Simpson. The quartet has thirteen variations, of which the first goes out of its way to be discordant. The others that stand out most are the seventh (“Misterioso”) - a haunting serial wisp in harmonics – and the eleventh, described as a “rather minimalistic process piece” with moto perpetuo top strings and cello pizzicato. The eighth variation is described as “Tempo di Mazurka” but doesn’t sound much like any mazurka I’ve ever heard. I have to say that I didn’t find the “rumpus” ending very pleasant (not enough “pastorale”) and was relieved when it came to a sudden stop. Not a great success for me, then. Perhaps you will like it better. With the exception of Matthews’ short 1975 attempt at a variation on the same Diabelli theme that had inspired Beethoven, the remaining works on the disc are all of his transcriptions of Beethoven piano works for string quartet. Beethoven was annoyed by the trend of publishers making arrangements of other composers’ piano works for string ensemble. He retaliated by arranging his own piano sonata No. 9, Op.14/1 before anybody else did. Under the circumstances it is slightly perverse to make further arrangements but Matthews seems to have done so principally for his own pleasure. As transcriptions go they are perfectly competent – as one might expect – and the Op.101 sonata works reasonably well as a quartet — which can probably also be said for a number of Beethoven’s other piano sonatas. It is mildly interesting to hear these transcriptions but I, for one, prefer the originals. All the works are presumably played to the composer/arranger’s satisfaction and the performances for the most part sound pretty good – although I sometimes felt that the transcriptions were a bit earthbound. The recording of the transcriptions feels uncomfortably close-miked and, whilst mostly clean, is occasionally near to distorting. Strangely, the quartet recording seems to fare rather better. Other discs in this series have been enthusiastically reviewed (see below), so if this is your bag, go for it. I shall be interested to see if the eleventh quartet inspires any other recorded performances within my lifetime or whether it meets the same oblivion into which Simpson’s quartets have fallen. On this evidence of Matthews’ chamber music I shall probably confine myself to his orchestral compositions.